Dr. Cynthia Chin serves as a thoracic surgeon and Director of the Women’s Cancer Program Services at White Plains Hospital, where she relocated her busy practice from Mount Sinai Medical Center. She is board certified by The American Board of Thoracic Surgery and The America Board of Surgery and is a Fellow of the American College of Surgeons. 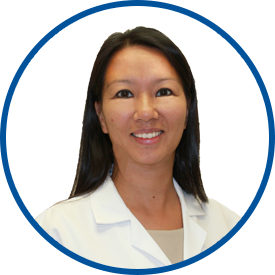 She has extensive experience in treating both benign and malignant conditions of the chest and its structures. With the use of minimally invasive video-assisted techniques in the treatment of cancers of the lung, esophagus, and thymus, Dr. Chin has enabled her patients to have minimal pain, fewer complications and faster recoveries. Dr. Chin earned her medical degree with honors from the State University of New York at Stony Brook School of Medicine. While she completed a general surgery residency at St. Vincent’s Hospital, she devoted two years as a surgical oncology research fellow at the Medical College of Virginia, where she studied the interactions of the human immune system with cancers. Following her residency, Dr. Chin completed a fellowship in cardiothoracic surgery at Mount Sinai Medical Center. As a clinical fellow in thoracic surgery at University of Pittsburgh, Dr. Chin received specialty training in the minimally invasive surgical management of esophageal cancer. Upon completion of her training, Dr. Chin was appointed assistant professor of cardiothoracic surgery at Mount Sinai Medical Center.